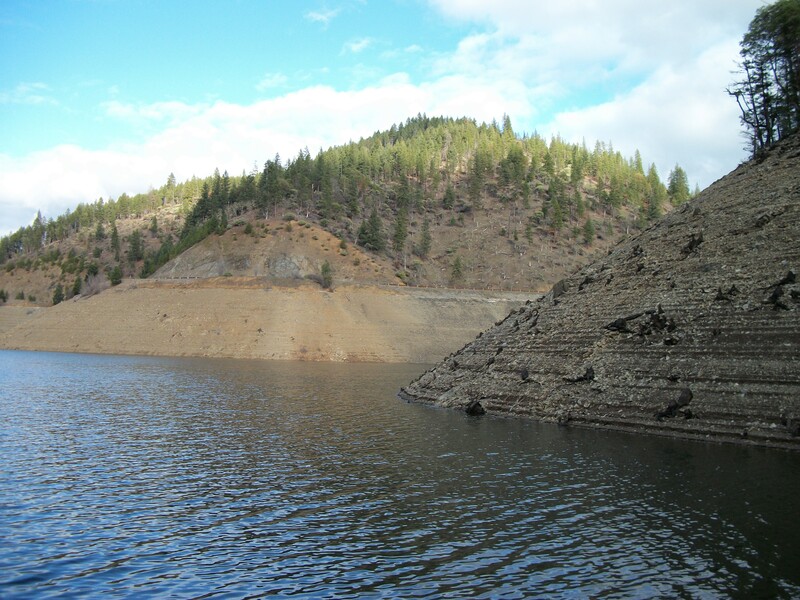 The most memorable part of this trip other then catching 75+ bass a day would have to be me flipping my boat and swimming through Smith Ferry Rapid . Looking back at the incident I can laugh, mostly because nothing bad happened except for losing a few things. I did more then a few things wrong going down this set of rapids and the number one thing, I wasn’t wearing my life jacket. Before committing to going down I stopped on the side of the river to add more air to my pontoons and I was going to get my life jacket on, but I didn’t take the time and effort to unstrap it from my seat, I had it bungee corded on with a bunch of stuff. Second biggest mistake was that my boat was super back heavy, as you can tell from the photo in my last post. That combined with leaning back in my seat instead of forward while going through the big waves, led to my demise of flipping. Third mistake was not getting out and scouting what I was about to go down, all I knew was it sounded gnarly. Fourthly and lastly was I should of done a better job of making sure everything on my boat was secure and or water proof. My small color was dumped with its contents, my shirt was lost which I wasn’t wearing since it was wet. And my net was lost, luckily my fishing rods and video camera were secured to the boat good. The second day on the river started out really well, catching some nice fish and seeing new waters. While floating along I could tell we were coming towards a rapid or what I like to call it a drop. I was lagging behind and before I got to the rapid I made sure my rods and a few other things were secured. Before going down the drop I looked to my right and seen Colby and his jaw dropped, I don’t think he believed I was going for it. Even though I didnt scout it out I made it through successfully and had a blast! I tried to talk the others into carrying our boats to the top and running it again. None of them were down though, ha. There is a small slot on river right if you prefer not to go down fun rapids. That was the first drop which the photo was taken at the bottom of. This section only has two tricky sets of rapids and both you can portage around. And here’s my infamous video of me flipping my boat at the Smith Ferry Rapids on the Umpqua River. I apologize for the poor camera angle, my video camera was secured to one of my rod holders which is on the right pontoon. Getting tossed out wasn’t as bad as it could of been for me especially since I wasn’t wear my PFD. Luckily I didn’t get sucked down into the rapid and get beat up against the rocks, which could of happened easily. I struggled trying swim at first but eventually let the river take me, and it took me into the same eddy that my boat was in. I sat there trying to catch my breath for a couple minutes then flipped my boat up right. After I realized my rods, camera, and myself were fine, I got back in my boat and shared a laugh with my friends. Colby with a nice Umpqa River Smallie. The trip was quite awesome. Fishing new waters, catching around 100 bass a day, meeting a new fishing pal Danny. Just all around good times!! Thanks for reading, and Tight Lines! Iv decided to take this blogging stuff serious once again. No slacking, anymore. Ill be updating some old post and also adding new post from this past year. Look forward for some really sweet reports, pictures, and videos. And Ill hopefully be doing some contests and other cool stuff, so be ready! So But for now Iv got some good news Id like to introduce my newest sponsor, The Creek Company. Iv been using one of their pontoon boats for about three years. And iv caught many nice fish from it and had many more nice days on the water, whether it be a river, lake or a pond. I contacted them recently about sponsoring me and my fishing adventures and they have decided to do so! In other news id like to help promote one my buddies. 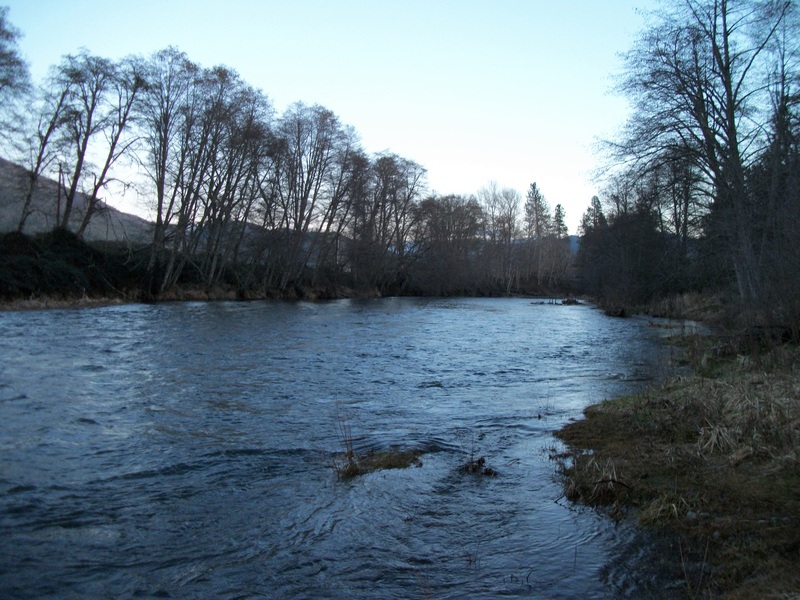 NorthWest Killers Fishing Is doing a steelhead tournament, called The ChromeDome Challenge. And it starts tomorrow December 1st. and goes through February 31st. Each month is a separate tournament and cost $10 a month or $25 for all three months (only if you sign up today!). First place each month is the longest Hatchery Steelhead, grand prize is the longest Hatchery Steelhead for over the 3 month period. Id get in on The ChromeDome Challenge as I have. Just for entering you get a free shirt, also there are prize give a ways even if you don’t get a top three fish! Tight Lines! And good luck to those that enter! 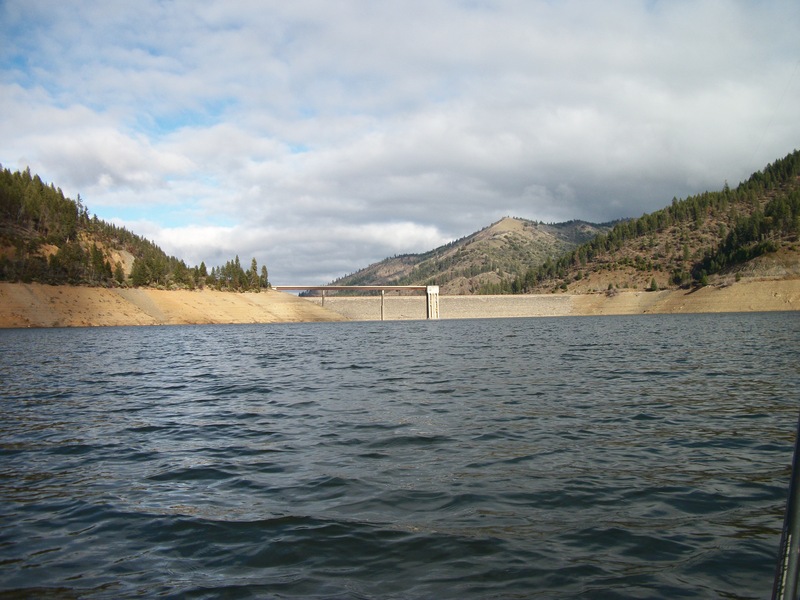 Camping Trip – Wickiup, East Lake, and Hills Creek Res. Went on a camping trip on Wednesday (7-25-12) and got back earlier today (7-31) . 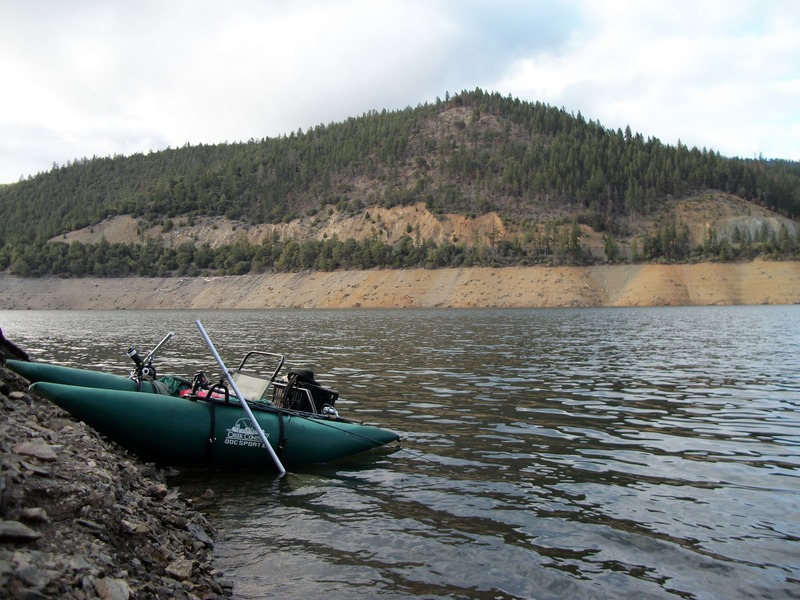 Spent Wednesday through Sunday at Wickiup, Sunday night at East Lake, and Monday night at Hills Creek Reservoir. Fishing wasn’t spectacular but the weather and two fish made up for the lack of catching. I got to Wickiup Wednesday afternoon and put together my camp site and pontoon boat, by the time I had all the boat and tent stuff put together I had drank a few beers and the wind let up so it was time to get out there! I trolled around until my stomach told me it was times for brats and more beer! While trolling back to my camping spot my Ultra Lite rod goes down and stays down, if i hadn’t known I was in some pretty deep water I would of thought it was snagged up! After picking my rod up out of the holder and a few turns of the reel the fish comes flying out of the water completely and I then knew I had a sweet trout on! After a couple more jumps and runs when it got near the boat I was finally able to net it! 22″ inch and around 3lbs of great meat! I ended up up having a fillet for dinner instead of the brats, and the next night I ate the other fillet, bacon wrapped with onions, garlic and lemon juice. I thought fishing would be great considering the first days fish, but that wasn’t so. 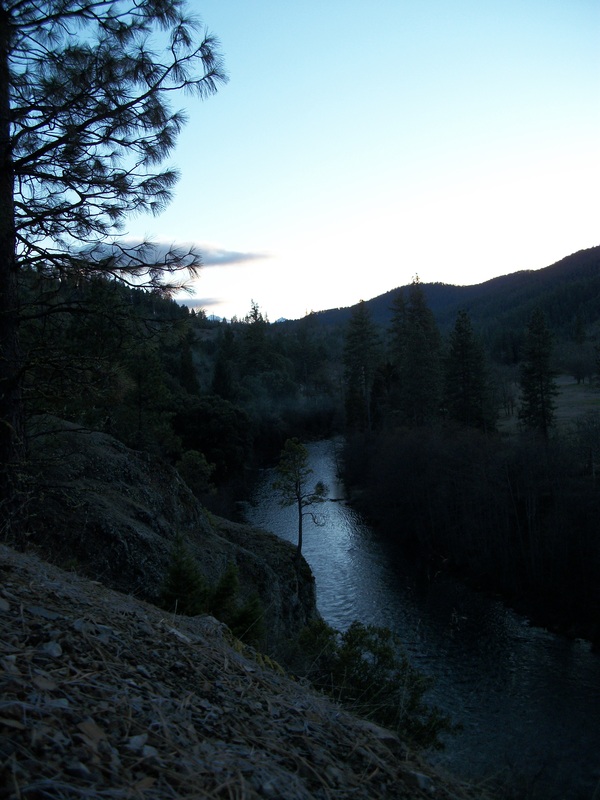 Didnt catch any fish at wickiup Thursday – Saturday. Left for Lava Lake on Sunday, but after taking the wrong road I ended up in Sun River. After buying more ice, beer and a corn dog I decided to head to East and Paulina Lakes instead. East was a very sweet lake except for the fact I couldn’t find any free camping. Ended up staying at Cinder Campground, very nice campground. Fishing at East was a lot better then at Wickiup, I was getting a lot more bites. Once the wind picked up Sunday evening I went back to camp and picked up my anchor and headed back out and sat on anchor and fished a whole worm on the bottom with no weight. About 45min later I started to get bit and picked up a real nice feisty 15″ Rainbow. The next morning the fish were eating off the surface like crazy! But they weren’t real interested in my offerings only got a couple bites Monday morning before leaving the lake. Got to see a poodle with a life jacket on out there though, pretty funny seeing a mid sized poodle on a pontoon boat! Monday I camped out in the back of Hill Creek Res. near the back where the creek comes in, was really nice scenery and very peaceful but no fish for me at this lake. Great weather everyday made for some sweet camping and the mosquitoes weren’t bad at either lakes! Thanks for reading, and ill add more details and pictures when I get back from camping. Sunday i wanted to kill my skunk, not literally for those that dont know fishing lingo. The day before i made some modifications to my pontoon boat. Installed two rod holders and a basket for extra storage. So i really wanted to get out on the water and give my new additions a try. 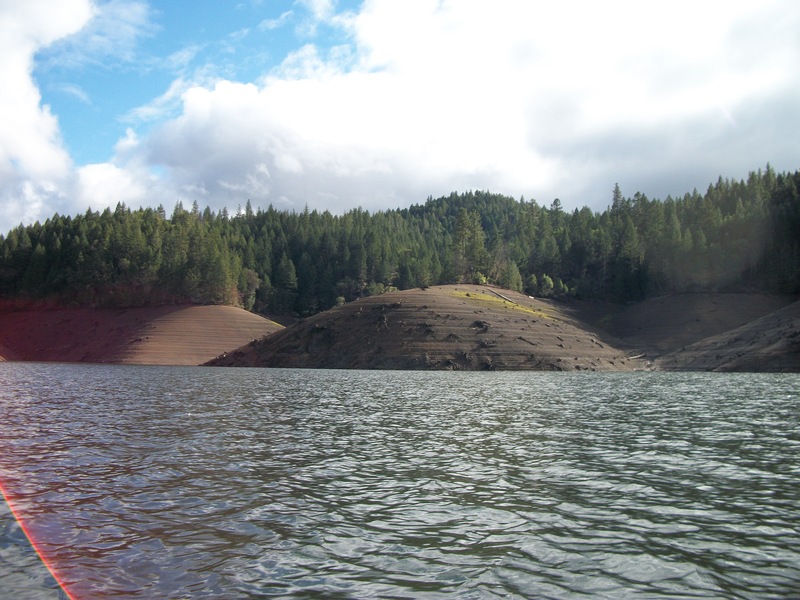 I got to Applegate lake shortly after noon, there were only 2 other boats on the water, another toon, and a drift boat. The water is really low, i think the lake is at around 20% full. The guy in his toon was fly fishing and said he caught a few smaller trout. 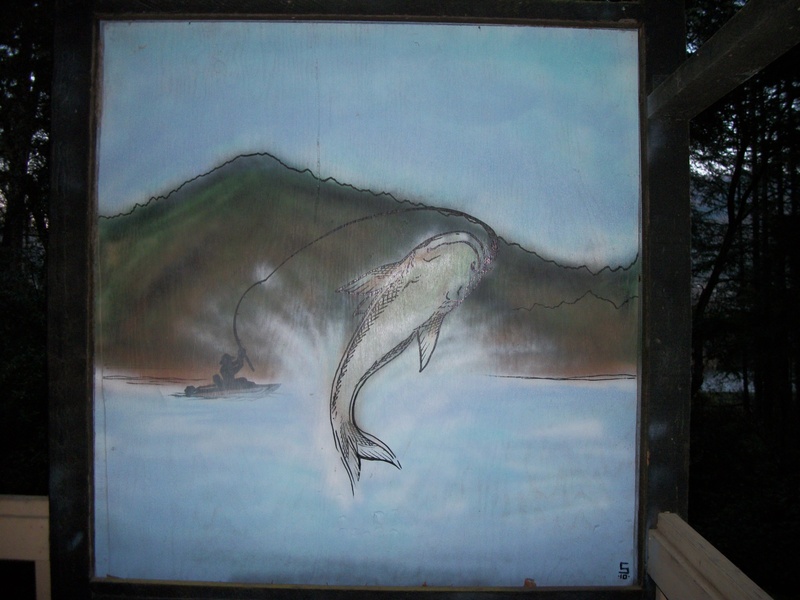 Like usually at applegate lake you could see the trout surfacing and jumping. I fished with spoons and spinners mainly, floated power eggs off the bottom for a little and tried some under a bobber as well. And… The skunk lives on. Had some bites but nothing to the boat. I let the wind blow me a good ways across the lake near the campground, i pulled my boat up on shore and did some bank fishing there. I then had to row into the wind all the way back to where i put in at. This was not fun. I guess i should of taken my toon out to a smaller body of water since i hadnt been out rowing since November 5th. Also a anchor would been nice, gonna look into buying/making one. 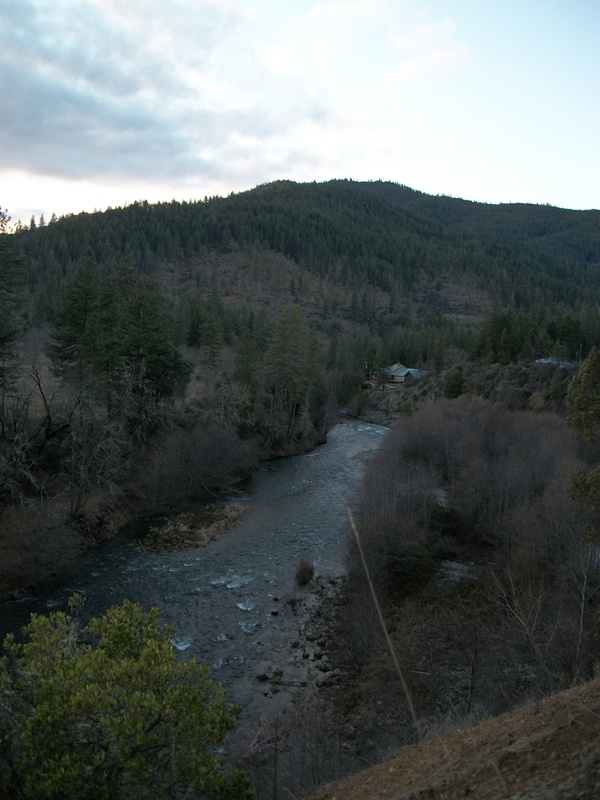 I ended my day by scouting out a few places along the Applegate River to do some steelhead fishing at in the weeks coming. Until next time… Tight Lines! 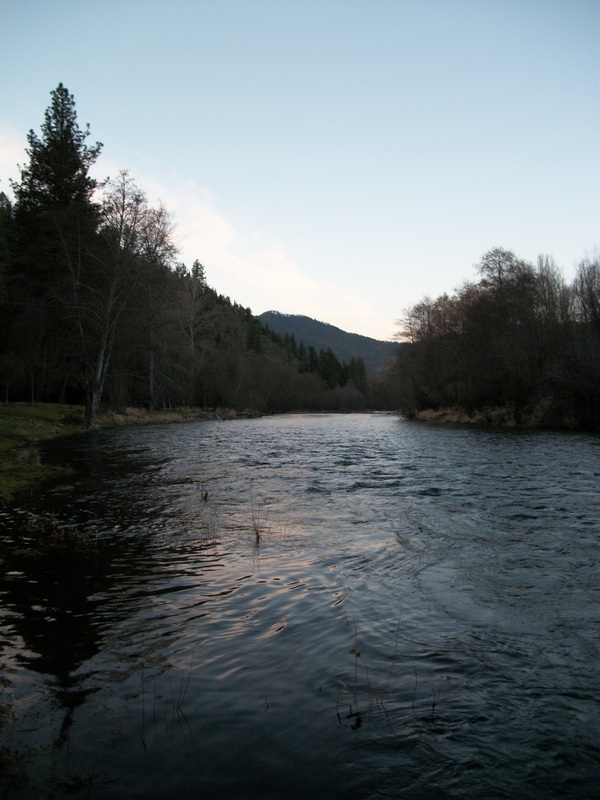 The last picture was taken at Cantrall-Buckley Park along the Applegate River. I thought it was a pretty cool painting.